Largely unchanged, Ubuntu 15.10 (code named: ‘Willy Werewolf’) is a less exciting release, well, for those that use the desktop version at least. Kernel is updated to version 4.2, X.org to 1.17.2, Compiz 0.9.12.2 and Unity desktop version is still at 7.3.2 (the same version included in Ubuntu 15.04) without any major features as well. The default set of applications are also updated (Firfefox 41.0.2, LibreOffice 5.0.2.2, Ubuntu Software Center 13.10 and most of the other set of applications which are part of the Gnome3 desktop are updated to 3.16.1, except for the file manager where it’s version is 3.14.1 since it’s patched separately by Ubuntu). From a technological point of view, according to the release notes, a lot of efforts have been made to smoothen the transition from the Upstart (init daemon -- a core utility that manages boot-up services & applications that work in the background called ‘daemons’) to Systemd which was first initiated with the Ubuntu 15.04 release. There’s also a technological preview of the upcoming Unity 8 desktop as well. Previously it was also mentioned that ‘TLP’ (a handy power usage optimizer) will also be shipped by default, but it has not made its way to this release due to unknown reasons. As I always do, I’ve measured the performance aspects of the operating system and have compared it with the current LTS (long term support) which is the version 14.04 (since it’s like the flagship version of Ubuntu’s desktop release) and with the previous Ubuntu 15.04 version. Please remember that after installing the OS, it was these performance aspects I measured first without making any tweaks, though I added the ‘system monitor’ icon to the Application Launcher before measuring the memory usage (otherwise, if I was to open it through Dash, it would’ve decreased the accuracy level). That’s the only change I made. And, I took five samples of each test before coming up with the average values, except while measuring the power usage since there’s actually tool which when you once run, takes a lot of samples and is quite accurate. 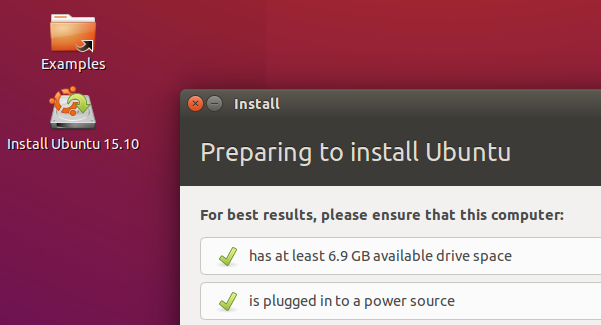 The admirable Ubuntu installer (I love its simplicity) also hasn’t changed. It’s quite perfect just the way it is actually, and as the saying goes ‘Don’t fix it, if it ain’t broken’, right? 🙂 . Anyhow, the installation was carried out without any issues whatsoever and unlike many other distributions, Ubuntu 15.10 was able to correctly identify Fedora 22 and had added an entry in the GRUB menu. GRUB & the Boot-up logo look the same, and I’m pretty sure almost everyone has seen how they look, so I won’t add any screenshots here (it’s actually quite difficult to capture the GRUB screen & the Boot-up logo, otherwise, I would’ve added them here). As far as the desktop layout is concerned, there are no major changes. 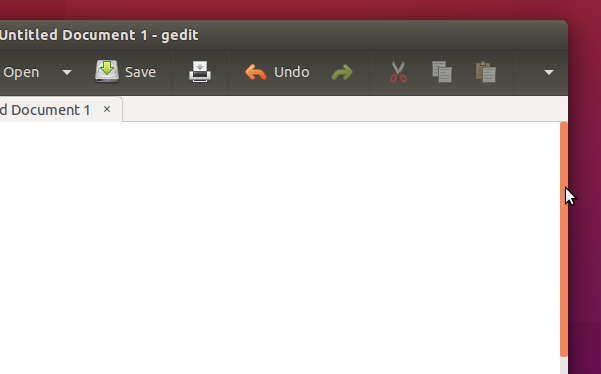 However, when it comes to applications, Ubuntu’s overlay scroll-bars are now gone and they’re now replaced by Gnome3’s scroll-bars. That said, they’re not yet completely gone as they’re still being used by the Dash. There is another subtle but a handy change added to the terminal emulator. That is, by default now the ‘login prompt’ is colorized. This of course is not a new feature and is a existing feature that has been simply activated by editing the ‘.bashrc’ configuration file. But still, it makes a distinction between the output of the commands and the user ‘login’, which again, is handy. There could be other new features in individual apps that are part of the Gnome 3.16 release, but as far as the ‘Ubuntu touches’ are concerned, these are the easily visible, minor changes. Oh and, the default wallpaper is slightly changed too, & overall, I like the collection of wallpapers included in this release as well. Now we’re done with it, let me share with you the performance related data. As you can see, the boot-up speeds of both Ubuntu 15.04 & 15.10 were very close, but 15.04 was a little bit faster (about 4.3%). The clear winner however, is Ubuntu 14.04 LTS where it beat Ubuntu 15.10 by being about 30.6% faster!. And according to my data, little by little with each release, Ubuntu is getting slower to boot. Here too Ubuntu 15.10 was the ‘heaviest’. It used 12.5% more memory compared to Ubuntu 15.04 and about 20% more memory compared to Ubuntu 14.04 LTS. However, I’m not so much worried about the increase in memory usage because after all, these days computers are equipped with at least 4 GB of RAM and 426.2 MiB is still relatively lightweight. What I’m worried about, as mentioned earlier, is the increase of the boot-up delay. In all my reviews, before measuring the power, I turn on the Wi-Fi (connected to my wireless router), turn off the Bluetooth adapter, set the screen to its maximum brightness level (and disable dimming, screensaver, if any etc) and let it idle. 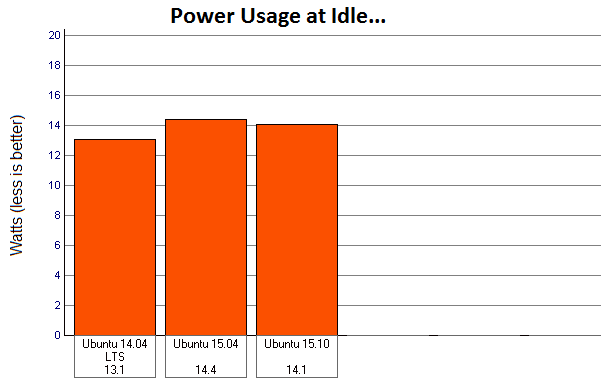 Here however, Ubuntu 15.10 at idle, consumed a fraction less Watts than Ubuntu 15.04 did. But here too, Ubuntu 14.04 LTS is the clear winner. That said, unlike boot-up or the memory usage readings, which are usually beyond the user’s ability to fix, power usage issues are almost on all occasions can be fixed (at least on my hardware) by installing a power usage optimizer such as ‘Laptop Mode Tools’ or ‘TLP’ (I prefer this due to its simplicity). 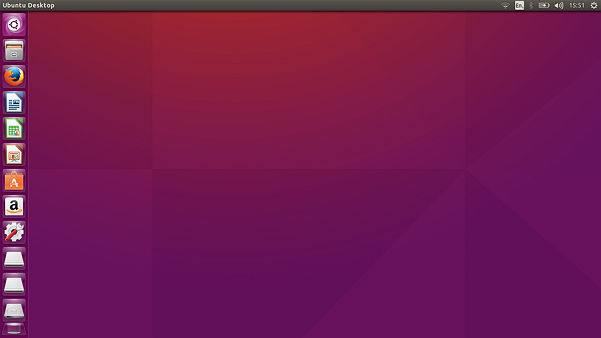 As you can easily see, after installing ‘TLP’, Ubuntu 15.10 only consumed about 12.4 Watts (12.1% less). And I did the same previously on Ubuntu 15.04 and ‘TLP’ on that version of Ubuntu was able to reduce it to 12.01 Watts. Still, I’m quite happy with the result. At idle, other processes did not interact with the CPU for longer periods, except for the Gnome3 ‘system monitor’ process which kept using 2-3% CPU cycles (this is a known observation in my experience). When your computer’s screen is at idle, meaning when there is no activity, the frames rate should be set around zero. If the frame rate is significantly higher than zero at idle, it means more work for your GPU which ultimately leads to more power consumption and in some extreme cases, your fans will be forced to operate at higher speeds thus increasing the noises as well. The reason I became interested in this ‘test’ was because in the past, on one occasion, after opening the Dash and leaving it to idle (unintentionally), after a couple of seconds, my laptop’s fans kicked in with some heavy noise and I knew something is using the GPU somewhat heavily. So I searched for a solution to figure out what is going on and that’s how I came across this handy Compiz plugin (Compiz is the window manager of Ubuntu. To put it into a simpler context: The ‘window manager’ is the utility that provides your application windows with Minimize, Maximize… buttons and it’s also the one that lets you move those windows around). The same thing happened when I opened HUD and let it idle. So out of this habit, when reviewing Ubuntu releases, I just run this plugin and see if such issues are there. I did the same thing in Ubuntu 15.10 where I measured the FPS on the desktop, on Dash (at idle), with Dash unmaximized (because also when unmaximized, Compiz had a tendency to increase the FPS, it’s crazy I know!) and on HUD (at idle). Sadly, I could not do this in Ubuntu 15.04 because the plugin didn’t work correctly back then, so I was forced to compare the results with Ubuntu 14.04 LTS. As you can see, the frame rate is pretty close to zero. Excellent (pretty much the same in Ubuntu 14.04 LTS as well). Here too there are no complaints. Now here we go again. As I briefly mentioned earlier, even if the frame rates were set around zero on Dash when it was in fullscreen (default), as soon I unmaximized it, it started to fluctuate around 15-19 frames per second!. And unsurprisingly, my fans kicked in with their noises, yuck!. How was it in Ubuntu 14.04 LTS? Well, it was set around an impressive 0.24 fps! (shown below). But in all fairness, this is not a huge issue at all. I mean, most people would open Dash in fullscreen which is the default setting and even if one opens it up unmaximized, it won’t be let to idle for longer periods (I’m just assuming 😀 ). On HUD it was just a little bit higher, but I guess that’s due to the blinking cursor mostly. The readings on Ubuntu 14.10 LTS was very close to this value (2.49 frames/sec). P.S: Please don’t take these readings (or pretty much anything on this review for that matter) and think that it’ll be the same on your computer. Because this is largely depended upon Compiz and the GPU driver (my best guess). In other words, it could be either worse or not an issue at all, depending on your hardware configuration. Ubuntu 15.10 configured my hardware quite well (there’s no proper driver for the bloody proprietary fingerprint reader yet). Desktop was able to successfully restore the previously set values of the brightness, On/Off state of the Bluetooth adapter… they all worked well. Suspending also works without issues. 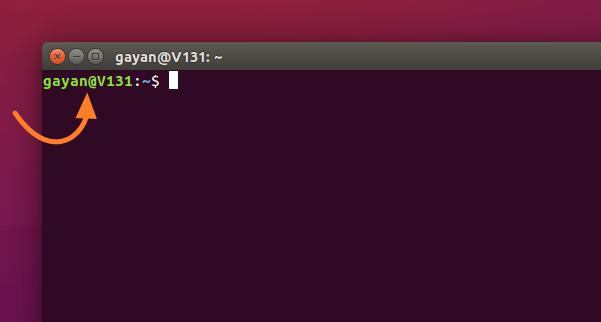 In Ubuntu 15.04, sometimes the wireless internet connection got lost, but I’m happy to say that so far, no such issue has occurred in 15.10. But on two occasions, while I was using Google Chrome & Virtualbox (yes I had them manually installed), I was forcefully logged out of the desktop and brought to the login window. Even though I was able to log back in, but I lost the opened tabs of Chrome, though there are ways to recover from that, the data of the apps I had opened in Guest OS under Virtualbox, well, they were gone!. When I logged into the desktop, Ubuntu 15.10 ‘said’ that X.org (a collection of utilities that are responsible for ‘drawing’ the application windows, literally) has crashed and asked me to report the bug (which I did). Again, this is a major issue and so far it has happened twice. I don’t know if it was Google Chrome’s or Virtualbox’s fault or X.org’s (I’ll keep you guys updated)… but it just came out of no where. Scary stuff! 😀 . Update (2015-11-15): I’ve been using Ubuntu 15.10 as my main operating system for about a week now, and I’ve installed the latest updates from Ubuntu too, but so far this issue has occurred two more times and on both these occasions I was using Google Chrome. Update (2016-01-01): Well, I’ve been using this OS for about two months now (yes, as my main operating system) and with the recent updates (have no idea when it happened, though), this Xorg crash now finally seems to be fixed as I’ve used it for a couple of weeks without any such errors. Easily overlooked by many, this is one of my favorite & important tests. What I do is simple. I copy a file (usually about 1.5 GB) within two locations on my ‘Home’ folder, and as soon as the file copying starts, I try to play a multimedia file (I had installed VLC manually), and then try to open a couple of programs, if it’s Ubuntu, then I try to open some using the Application Launcher and some using the Dash so that I can put more pressure on the OS. Then I observe the cursor’s sensitivity, how many programs get opened, the quality of the multimedia playback, all before the file finishes copying. If the cursor sensitivity is not lost by that much, if most of the programs get opened and if the multimedia file playback doesn’t get interrupted heavily (after all, I’m putting the OS under somewhat a heavy I/O activity), then I consider the OS to be responsive. So I did the same thing in Ubuntu 15.10, and it sucked!. Not only VLC was unable to start to play the file before the file was finished copying, except for one, it was very difficult to even try to open apps by searching in Dash as even for the applications that I knew were included by default (such as LibreOffice), after a long delay, Dash failed to find them!. It was disaster. I was not surprised however. Because I’ve observed this on both Ubuntu 15.04 & 14.10 and they both sucked at this test, at first. My solution on both of those occasions was simple. I simply changed the disk I/O scheduler (this is the tool that’s in control of how read & write requests to the disk drive are managed within the OS) from ‘deadline’ to ‘CFQ’. And it fixed the issue on those both occasions. So I did the same on Ubuntu 15.10 and unsurprisingly, it fixed it!. VLC was able to open the multimedia file quickly (sure the playback got interrupted 2 or 3 times, but they were very short lived), most of the programs got opened up before the file was copied (yes, Dash found the ones I searched for without huge delays). So all in all, I was quite happy with the overall improvements. 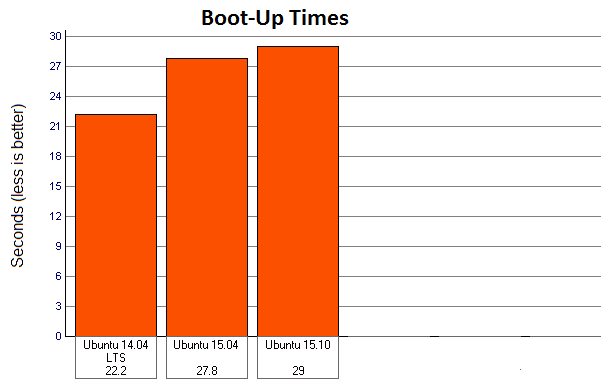 Ubuntu 15.10 outperformed 14.04 LTS by tenth of a second, but that’s pretty much nothing actually. But as you can see, here, Usain Bolt is Ubuntu 15.04. Still, a shutdown time below 4 seconds is quite fast. If you use Ubuntu 14.04 LTS and if it’s working out for you, then there really is no need to switch to a non-LTS release, especially to the 15.10. 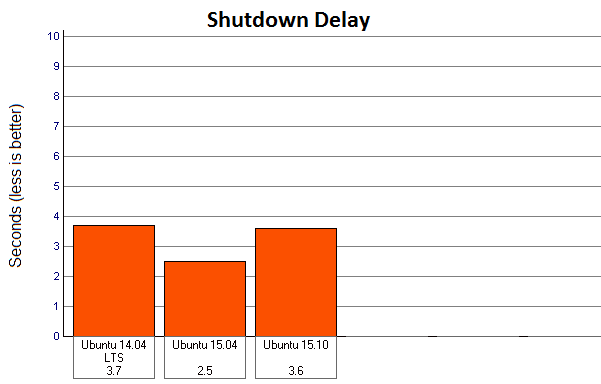 Except for the Shutdown delay, Ubuntu 14.04 LTS easily outperformed Ubuntu 15.10, so you’re good here!. 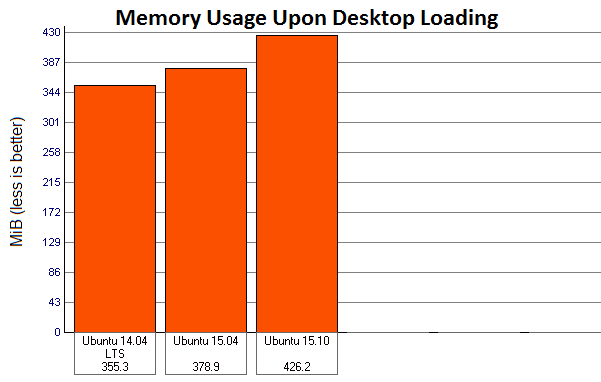 If you use Ubuntu 15.04, then in comparison, performance-wise, there are no major differences (well, except for the increase in the memory usage). And even features-wise, 15.10 only comes with one or two minor changes. So I honestly don’t see any major beneficiaries, except that, Ubuntu 15.04 will reach the end of its updates in January 2016, so in a way, users are forced to made the switch within the next two or three months. I don’t know if you can see, but I’m a little hesitant here because of the whole X.org crash. Sure it has so far happened twice and hopefully (that’s a big ‘hope’) if you don’t use Google Chrome or Virtualbox, then you’re probably going to be alright, but when it happens, with it comes dire consequences. But, all this happened yesterday, and today I’ve been using Chrome & Virtualbox in Ubuntu 15.10 for couple of hours now and so far so good, no X.org or any other crashes. So I’ll say this much. As a safety precaution, especially if you’re planning to use it in a production environment and have similar hardware (Intel HD 3000 Graphics), then I advice you to wait for another week or two and then upgrade or clean-install Ubuntu 15.10, and then immediately install the latest updates from Ubuntu servers, so that hopefully, if this is a major issue, by then it might have been dealt with. If interested, please download it from here and good luck. Thank you for reading!. Nice review. Thanks for the CFQ tip. I use 14.04 LTS on my desktop but always update my laptop to the latest version. We’ll see how 15.10 works. I was just curious, were both the 2 crashes before you changed the scheduler? I changed the scheduler because I had problems with opengl programs after upgrading to 15.10.
ie. Could only run 2 instead of 3 programs, and even then it was like took turns running. (Work apps, wine & games). I will keep your warning about VBox and Chrome in mind, since I usually run 2 VMs, Firefox and Chromium. Thanks for the review. I like your choice of benchmarks. Yes, it happened after I changed the scheduler. And you’re welcome too 🙂 . Gayan, after reading your article on I/O schedulers, I switched everything over to CFQ, even the LiveUSB’s I spin for friends. Thanks again for all the boot speed/temp/ram usage info, it’s quite usefull. PD: I also agree with you about TLP…it should be included always. Have you found problem regarding xorg crash. I too, am facing same problem. It once only after I boot. Having posted this question on Ubuntu Launchpad , but still no solution. Please reply if you found any solution. Unfortunately, I haven’t found a solution :/ . 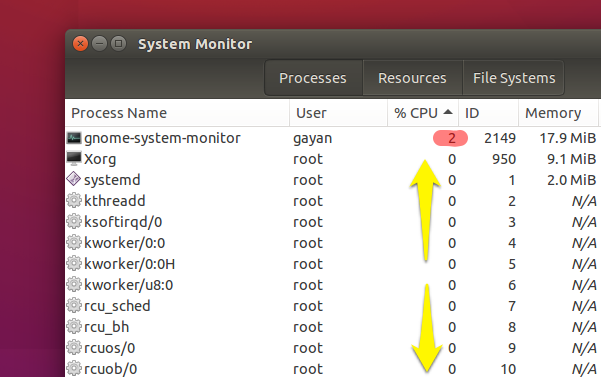 The system monitor is using CPU cycles because you are using to survey the system’s resources — in other words, Gnome System Monitor is not idle when using it. Run “top” or “htop” as an alternative. You’re welcome. Concerning your explanation: It’s true what you said (after all, the measurement itself does take some CPU time), but system monitors do have the ability to cut themselves out of the list. For instance, in KDE and in XFCE, I’ve seen everything (system monitor process included) being frozen (zero activity) for couple of seconds. Sure they pop-up here and there, but there are time-periods where there is zero CPU activity.